A new fall means a new round of PJP’s Over/Under game. Haven’t played before? It’s easy. Every week, we’re going to post over/under “bets.” We will be tracking picks on the website so please register if you haven’t already. We’ll keep track of how everyone does over the course of the season. The contest will include this season-long over/under, the 12 games, and hopefully a bowl game, after which we will crown a 2018 champion. EDIT: With Brandon Dawkins leaving, Michael Penix is the main guy that could split snaps with Ramsey. The past 4 seasons have seen Indiana have “the guy” at quarterback for 2 of seasons[ref]Nate Sudfeld in 2015 and Richard Lagow in 2016. [/ref] and a committee[ref]Sudfeld/Diamont in 2014 and Lagow/Ramsey in 2017. [/ref] in the other 2. In those 4 seasons, the QB leader in combined passing and rushing attempts has been 137 in 2014, followed by 293, 479, and 332. Interestingly, in years with “the guy”, Indiana’s quarterback reached 320+ attempts in only one of those seasons. In the two split seasons, the leading QB reached 320 attempts in one of the seasons. While splitting obviously decreases the chance that a single QB could reach this mark, the dependence on running backs also plays a factor. That’s what happened in 2015 when Nate Sudfeld reached just 293 attempts. While he did miss about a game and a half that season due to injury, Indiana leaned heavily on Jordan Howard and Devine Redding that year. The 2018 Hoosiers don’t have a Jordan Howard, but Morgan Ellison does a nice imitation although the complementary backs are, at this point, unproven. While Peyton Ramsey is the week 1 starter, Brandon Dawkins and Michael Penix should see action this season. Whether one of they takes the reigns remains a question. Last year Indiana’s longest touchdown rush by a running back in non-garbage time was 8 yards. Eight yards! 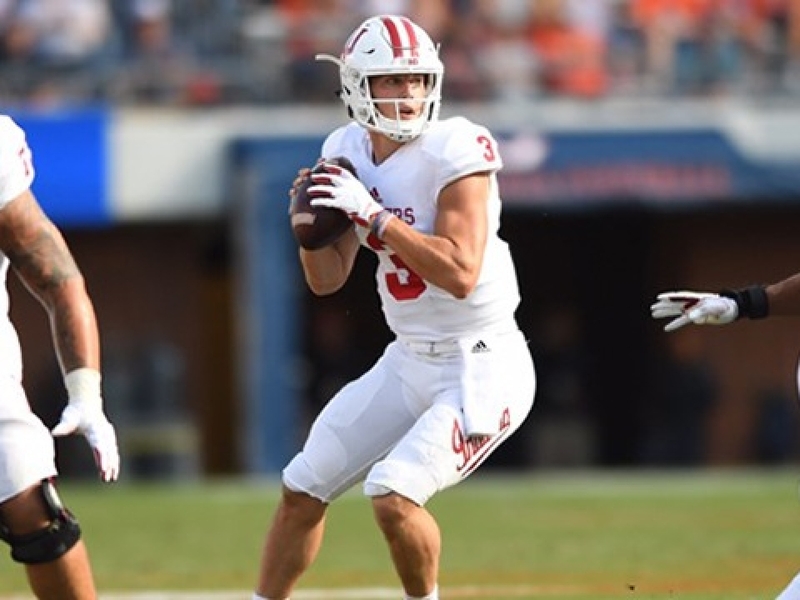 Although Peyton Ramsey had Indiana’s longest rushing touchdown of 26 yards against Virginia, the longest by a running back in non-garbage time was by Morgan Ellison against Michigan. In 2016, Devine Redding had touchdown runs of 34 and 33 yards. Obviously there’s been a lot of discussion about the lack of explosiveness among Indiana’s running backs. While no one is expecting Tevin Coleman levels of production, busting the occasional long run – preferably for a TD – will be a big boost to this offense. After a 13.5 yards per catch average in 2016, Indiana averaged just 10.4 last season to rank 127th out of 130 teams. In non-garbage time, IU’s yards per catch fell to 10.2. That is broken down into 11.0 with Richard Lagow at QB and 8.9 for Peyton Ramsey. The sophomore QB has stated his arm strength is improved since last year. He’ll likely split some with Brandon Dawkins and/or Michael Penix, both who should have higher yards per catch averages. [ref]Although not necessarily yards per attempt since Ramsey has a higher level of accuracy. [/ref] Additionally, Indiana’s projected receivers appear to be more equipped than the 2017 squad to break out big plays. Hopefully in year 2 at Indiana, Mike DeBord phases out the ultra-conservative offense in favor of a slightly more attacking offense. EDIT: With Dawkins’ departure, who knows if Taylor will see time at CB or if he’ll see an increased time at QB. If he’s forced into action as the primary QB, this one will clearly be won by the overs. By all accounts, the reigning Mr. Football in Indiana will play on both sides of the football this year with his primary role being at cornerback. Since we track the number of non-garbage possessions a player plays in, we’ll set the mark at 59.5 which is just under 5 possessions per game. Given A’Shon Riggins will likely take the majority of the possessions at one cornerback and Andre Brown and Raheem Layne will see time at the other, their performance (or injuries) may dictate how much Taylor plays on defense. Additionally, he’ll be batting with fellow freshman Jaylin Williams for time at cornerback. While it is hard[ref]But not impossible with the unpredictability of injures and the inconsistency and/or relative inexperience of the returning guys[/ref] to see a path to 5 possessions a game on defense, Taylor seems primed to add some time on offense, although it may be that deploying now-backup QB Brandon Dawkins in running situations will limit Taylor’s opportunities on offense. No one is questioning his play-making ability, but we’re all wondering how much we’ll get to see it in 2018. The departure of ends Robert McCray and Greg Gooch leaves a gap in the 2018 Indiana defense. McCray and Gooch ranked #1 and 2 on the team in pressures generated[ref]Sacks, knockdowns and hurries, compiled by Dan based on his play-by-play review of IU’s games. Non-garbage time only[/ref] with 17 and 13, respectively. Fortunately Nile Sykes returns in 2018. He led all ends with 12 pressures in 2016 and should lead Indiana’s ends again this year. Behind him, are big question marks. Allen Stallings, the likely backup to Sykes at WDE, generated 5 pressures last year. Gavin Everett, the assumed starter at SDE, generated 1 pressure last year. Stallings and Everett should see bigger roles in 2018 but it will be huge for Tom Allen’s defense if they[ref]Or perhaps one of the unproven players such as Michael Ziemba, Alfred Bryant, James Head or Jonathan King[/ref] can generate supplemental pressure. Last season Indiana’s 13 turnovers recovered ranked 111th nationally. The Hoosiers were probably unlucky in their recovery rate. They faced 19 opponent fumbles, 32nd nationally, but only recovered 8. However, they also didn’t do enough to force turnovers, especially in the passing game. They had just 3.58 passes defensed per game, 101st nationally, and 0.83 forced fumbles per game, 55th nationally. The year prior Indiana defensed 5.92 passes per game and forced 1.0 fumbles per game. That led to 23 turnovers recovered (in one extra game). Given the expected step back of the overall defense in 2018, recovering more turnovers will be a good way to counter the loss of many of IU’s most experienced and talented defensive players. Indiana has been spoiled at kicker for the last 8 years. [ref]Indiana 1, Alabama 0[/ref] Between 2010 and 2013, Mitch Ewald made 80% of his field goal attempts. Then replacing Ewald,[ref]Technically Aaron Del Grosso at the start of 2014[/ref] Griffin Oakes made 87% of his field goals. Now we are back in unknown territory with Logan Justus, Jared Smolar, and Charles Campbell battling for field goal duties. Given the consistency of Oakes, it’s almost certain Indiana will regress in this area. The question is by how much? Vegas has the line at 5 and Bill Connelly of Football Study Hall has IU projected for 5.5 wins. But we’re an IU football site read by IU football fans hoping for a breakthrough season. The smart bet is the under here. The Hoosiers face 4 teams in the AP top 15 and have about a 50% chance of losing all 4. [ref]And about a 50% chance at winning at least 1! [/ref] Then there’s the slate of toss-up games that you’d expect Indiana to win about half of them. If the Hoosiers win less than 6, it will put enormous pressure on Tom Allen[ref]Fair or not[/ref] in 2019. If Indiana wins 6, they’ll make their 3rd bowl game in 4 years, their best mark since the mid-Mallory years with 6 in 8 years. If Indiana can win 7, it will start to give the Hoosiers some serious momentum in a tough Big Ten East.